Dursley is fortunate to have always had, and still has, a wide variety of clubs and associations which cater for all tastes. These range from sporting activities, official organisations through to clubs and societies for young people such as scouts and guides and the Air Training Corps. One of the town's oldest sporting clubs is Dursley Association Football Club which began way back in 1893 as Dursley St. James as it still going in 2009. Football was not the only sporting activity though; cricket, tennis, rugby, hockey, bowls and many others have all made their mark in the town. In fact cricket was actually established in Dursley in 1882, 11 years earlier than organised football started up. 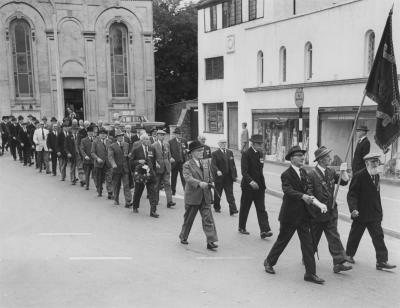 The Dursley branch of the Royal British Legion started up in 1948 and took charge of its own clubhouse in May Lane the following year. In 2005 membership had declined to such an extent that a decision was taken to sell these premises and in 2006 the branch moved its Headquarters to the Community Centre on Rednock Drive. Since then the branch has merged with the neighbouring Cam branch and membership has doubled and this trend looks likely to continue. Its members still mark the Remembrance Service every November with a parade in the town centre. Dursley Women's Institute has also been going a long time and continues to thrive. An unusual group which met at the Cross Keys Inn on Boulton Lane in the early years of the 20th century was the "Knuts Club". It seems to have had something to do with agriculture or at least gardening but was possibly just a social group. Still very active in the town is the Lions Club which meets at the "Lions' Den" in May Lane. Weekly secondhand furniture sales provide a good income to enable them to make donations to many worthy causes in the area.